The Greatest lie in the church is believing is you can fix your life with your good deeds. It will leave you bound, fearful, and unfulfilled. Ever since I can remember I was taught to judge and focus on peoples outward appearances. Much of this came from the teachings of Bill Gothard and that of the patriarchal movement. I was raised to be a Pharisee. I thought that those who did not dress like, act like, or speak like me were sinners, and I was honestly scared of anyone outside of my community. I was fearful because I didn’t have any real reason to believe what I believed other than to grasp onto something to find self-worth. It wasn’t until Lord began to reveal Holy Spirit to me. Holy Spirit showed me not only the Love of God but the relationship and communion that all of mankind can experience with Jesus. The mindset of self-righteousness doesn’t always manifest itself in an external treatment of other people. It is merely putting your faith in your good deeds or the lifestyle you live. I found my identity in the way that I lived and the church. In 2017 I made a ton of bad decisions, and by the end of that season I looked at myself and realised that I was not who I wanted to be. For the first time in my life, I saw myself no longer through the lens of my self-righteousness. I had been broken. That brokenness is where I found peace and joy in Christ. I wasn’t so proud anymore. We all naturally look at each other’s faults and we compare ourselves, but if we truly looked into our own lives we would probably find a log in our eyes as the scriptures say. We can only bring the Gospel to others if we are first motivated by the love and friendship we find with Jesus. I spent years giving love and friendship out, in hopes someday it would come back to me. I know there is a sea of people, broken and battered coming to church looking for healing. You may be a person looked down on, or you may look down on others. No matter who you are Jesus is screaming in His word, My love is all-sufficient for you. He wants you to know that freedom and peace are only found in knowing Him, and He is your best friend if you would only let Him in. In Jesus God sees you as holy and blameless. “10 Two men went to the Temple to pray. 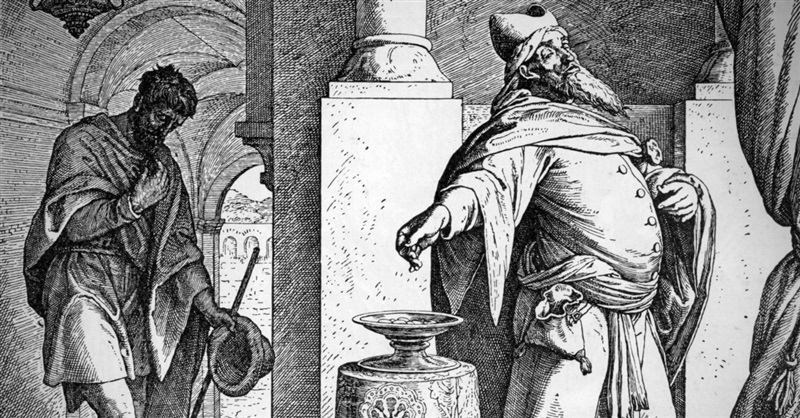 One was a Pharisee, and the other was a despised tax collector. 11 The Pharisee stood by himself and prayed this prayer: ‘I thank you, God, that I am not like other people—cheaters, sinners, adulterers. I’m certainly not like that tax collector! 12 I fast twice a week, and I give you a tenth of my income. Jesus wants nothing more than to pour Himself out on our lives. We must allow Him into not only our hearts but into the deepest wounds and our most shameful moments. That is where healing begins. You can’t start your faith in Jesus with striving to follow the law. You can only respond to God’s love. Otherwise, you’ll end up like me, hating myself, and trying to rectify that hatred by looking at others to feel good about myself. If you want to see a radical change in your life and the people around you all you have to do is let the Love of Jesus flow through your life and let him define your worth. If you feel you have been struggling to find victory over sin in your life or you have desired to hear God’s voice. All my life I have been trying to find a father figure who wouldn’t let me down. Jesus is the only one who will stick closer than a brother and never leave and forsake you. He wants to meet with you every single day and hear your heart. The only way I could to come into contact with Jesus was to forsake religion and let the Pharisee that I was raised be, die.